Some think an in vitro fertilization contest sounds crazy, but countless Americans desperate to start a family believe this social media sweepstakes is their only hope. Oscar-nominated Amanda Micheli’s provocative documentary follows aspiring parents struggling with infertility and the high cost of treatments. They place themselves in the hands of a Las Vegas doctor and his annual contest, which offers the prize of a free round of IVF—with no guarantee of success. As IVF technology advances, debates about reproductive medicine – the ethical boundaries, who should have access to it, who should pay for it – are exploding across the developed world. In the United States, IVF can be cripplingly expensive and is rarely covered by insurance. So while exposing private pain online to win a contest is a brutal proposition, many infertile couples consider this a gamble worth taking. Through this controversial contest, VEGAS BABY navigates the complexities of America’s burgeoning fertility industry and unveils the class disparity within a topic often clouded by judgment and stereotypes. Micheli paints an intimate portrait of the diverse individuals – from a devoutly Catholic Latino couple in Texas to a lesbian Lady Gaga Impersonator in Manhattan – determined to have a baby against all odds. Amanda is an award-winning director and cinematographer. Her film VEGAS BABY premiered at Tribeca before its 2017 release. In 2008, Amanda earned an Oscar nomination for LA CORONA, which premiered at Sundance before airing on HBO. In 2004, she premiered DOUBLE DARE at Toronto before its PBS and theatrical release. Her first film, JUST FOR THE RIDE, won a student Oscar and IDA Award and aired on PBS in 1996. Her other credits include: ONE NATION UNDER DOG, THIN, MY FLESH AND BLOOD and CAT DANCERS (all for HBO), THE SAVE (ESPN) and SLOMO (which was Oscar-shortlisted and won best short at the IDA and SXSW). 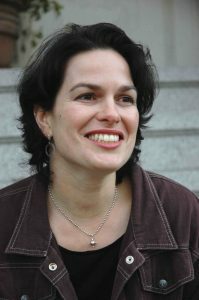 Amanda is a past visiting lecturer at Stanford’s MFA film program and a member of the Academy of Motion Pictures and the Director’s Guild of America.